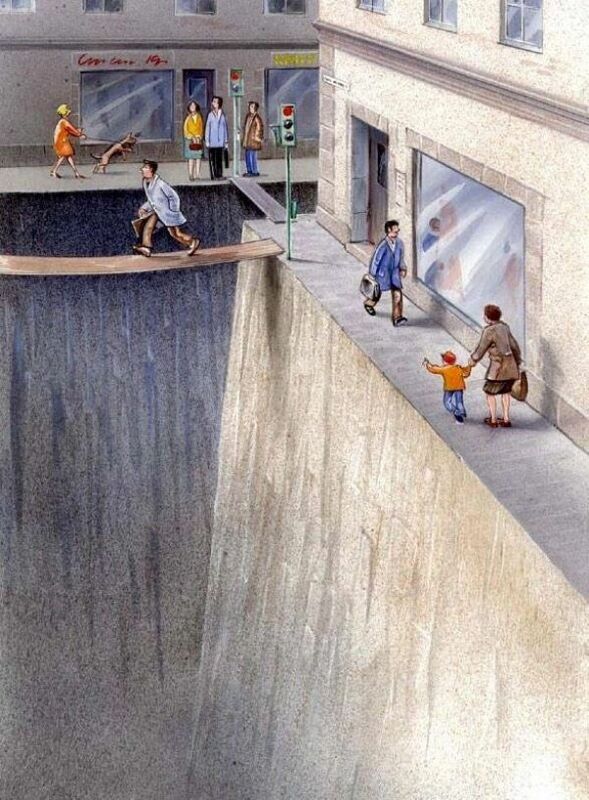 A painting that has been going around the internet for the past week dramatizes the pedestrian view of our streets and how we allocate space. The drawing, by Swedish artist Karl Jilg and commissioned by the Swedish Road Administration, was forwarded to me by a friend (who found it on Vox). Streets, it says, are yawning chasms of death, no-go zones with only thin strips along the edges where we can exist as people on foot rather than people sitting behind the wheel. It makes sense, then, that a barrier of parallel-parked cars would make us feel safer (as Jeff Speck notes in his book Walkable Cities), and that very wide streets with a lot of road frontage taken over by car space would feel very unwelcoming.